Today, Bertrand saw a corneal specialist for his eyes. Followers of this blog know of Bertrand's protracted battle against corneal erosion and his alacrima (lack of tears) since birth. The two ophthalmologists who saw Bertrand today, noted the scar on his right cornea but, other than that, found no evidence of corneal erosion. Bertrand did NOT have dry eyes. Furthermore, at home, Bertrand has been crying tears. This is especially remarkable because Bertrand still had severe xerophthalmia (dry eyes) just four short days ago. This was the second successful test of what I am calling "my thesis". If every parent claims to be the expert in their child, I am attempting to get my PhD in Bertrand Might. Liver damage, resulting in vitamin B12 & vitamin A deficiency, induced developmental delays, neuropathy, seizures, and alacrima. Now, please let me explain. I believe that Bertrand was born with liver damage because the jaundice Bertrand had at birth was not severe, but he could not shake it on his own. He had so much difficulty that he was hospitalized in the NICU. Bilirubin, the cellular byproduct that causes jaundice, is usually processed by the liver. This liver damage could be the result of an unknown genetic disorder or the result of an infection. While I took the best of prenatal care with Bertrand (vitamins, diet, doctors appointments, etc. ), I caught "colds" twice: once in the 1st trimester and once in the 3rd trimester. I was pretty miserable. Bacterial and viral infections can cause liver damage. Obviously, the most well-known of the viral ones are called Hepatitis A, B and C, but Mononucleosis (commonly referred to as "mono") can cause liver damage as well, and there are others. Such an infection could have damaged Bertrand's liver prenatally and possibly my own. The liver is where vitamins A, B12 and D are stored. It holds approximately a 3 year supply of each. If this supply is damaged, one is reliant solely on diet. Bertrand's diet for the first 5 months was breast milk. I wager that my milk was low on these vitamins, and the amount of these vitamins found in formula just were not sufficient given any pre-existing liver damage. And here is where things get a little perverse. Certain medications block the absorption of vitamins B12 and A: proton pump inhibitors and H2 receptor antagonists. These are the antacids also known as prevacid and zantac. Based on this, could Bertrand be vitamin B12 and vitamin A deficient? What are signs of severe vitamin B12 deficiency? Obviously, Bertrand has these. Multiple nerve conduction studies, EMGs, EEGs and MRIs serve as evidence. B12 is a primary component of the myelin sheath found on all nerves. Do you remember the MRI which I posted a few days ago? That was a case of B12 deficiency and it closely resembled Bertrand's MRI. B12 deficiency is almost always associated with malnutrition. It is not a first world disease. So, hematologically, it is associated with macrocytic anaemia, which can include folate, B6 and iron deficiency as well. However, Bertrand's case is NOT one of malnutrition. Bertrand has plenty of the vitamins which don't require liver storage. What does B12, and only B12, deficiency look like in the blood? It looks like really fat red blood cells (macrocytosis) and/or excess platelets (thrombocytosis), for unknown reasons. Yup, at his last blood draw, Bertrand had elevated MCH and MCV (measures of macrocytosis). And early on, he had elevated platelets. What are signs of severe vitamin A deficiency? I don't know about Bertrand's night vision, but he definitely had xerophthalmia and follicular hyperkeratosis. I say "had" because by this point, you can probably guess that we began vitamin B12 supplementation 2 weeks ago and vitamin A supplementation 4 days ago. With vitamin B12, he became more vocal and alert within hours. 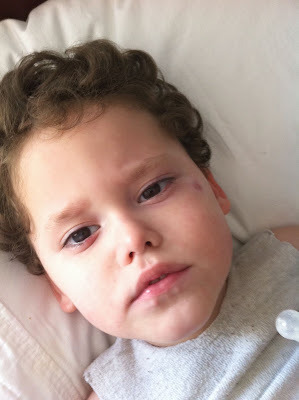 By day 3 his myoclonic seizures (jerks) stopped. By day 6, his night seizures stopped. By day 7, he was walking in his gait trainer. By day 11, we lowered his seizure medication and we have seen no seizures. Back to today's ophthalmology appointment, that was the first test of the success of vitamin A. We could tell that his eyes (& skin) had improved some within about 24 hours, but we've proceeded cautiously with the dose. Unlike B12 which is water-soluble, Vitamin A is fat-soluble and can be toxic. We're being cautious not to overdose. According to the medical literature, in cases of vitamin B12 deficiency, symptoms can be completely reversed--if caught early. EEGs normalize after about 5 weeks and there are MRI changes by 10 weeks. Unfortunately, Bertrand's case, if it is one of vitamin B12 and A deficiency, was NOT caught early. We should assume that there will be permanent brain and nerve damage. The way I see it, my "thesis proposal" is this Thursday, with Bertrand's neurologist. Then I get a few months to test and, in essence, watch "my dissertation" develop. And at some point, an EEG and MRI should serve as my defense! And, better than any sheepskin diploma, I will get a healthy, happy son! Right on!!! It's AMAZING that you've stopped the seizures. That's HUGE! I'm looking to seeing your thesis proven. I, Kristen M. Parks, hereby grant you, Cristina Casanova Might, a Ph.D. in mommyhood medical diagnoses, from the University of Kristen, and all of the rights and privileges therein on this day, the 30th of August in the year 2011. xoxoxo! I know I am not a trained medical professional. There's still the chance I am partially wrong... but my baby boy is singing and playing and taking steps--all seizure free. So, I clearly did *something* right. FINALLY! This is all AMAZING news! And, it makes me want to run right out and test my Sammie B's B12 levels. Incidentally, the one time I was tested (as a teenager, I was slightly low on B12 . . . ). And, I want video of that singing, playing boy strutting his stuff in his gait trainer! He looks like such much older in that picture! He sure is growing up!! Congrats on the great steps and improvements! Thank Heaven for mothers like you. We love you all and are pulling for you! Hace meses que seguimos junto a mi mujer tu blog. Hoy es el dia que por primera vez te escribimos. Vivimos en Argentina y tenemos a una hermosa hija de 1 año llamada Iara. Como te podras imaginar ella tiene epilepsia, más precisamente epilepsia catastrofica de la infancia. Desde el nacimiento tuvo hipotonia transtornos deglutorios etc etc. No tuvo ningun desarrollo neurologico, no se rió nunca, no sostiene la cabeza, no se alimenta. Tiene colocado un botón gástrico para alimentarla y darle sus 4 antiepilepticos y por supuesto desde hace 3 semanas la Ketocal leche para la dieta cetogenica. Obviamente...no tenemos un diagnóstico aún de lo que le pasó. Persamos que fue un evento 2 semanas antes de nacer. La han estudiado completamente sin embargo aún no tenemos un diagnóstico y pensamos que nunca lo vamos a tener. Mi mujer y yo te felicitamos por tu fuerza y coraje. Ojalá tu hijo siga mejorando poco a poco al igual que otros lectores del blog nos gustaría ver fotos y videos nuevos. Te mandamos un beso grande y saludos a toda la familia. How wonderful if you have finally found the source of his difficulties! It feels like it fits, doesn't it? I have been following your blog for the past 3 years. Bertrand is so adorable!! He is a special boy and has touched more lives that you can probably ever imagine through this blog. I pray that this is the answer to prayers and that he continues to improve. Good for you for continuing to research and to try to get to the bottom of things and doing the best for your child. God Bless.